A while ago, Seneca foods sent me a couple of jars of pickled beets to try. I used the whole beets in a roasted vegetable recipe and the sliced beets in a salad. (Note, I did rinse them first to reduce sodium.) They were quite delicious, and convinced me that beets are something I want to regularly include in our diet. These jarred beets, available at most supermarkets in the canned food area, or online , are an easy way to give beets a try. You also may want to look for Melissa's peeled baby red beets in the produce area of your grocery store (Super Target carries it in my neighborhood). They are steamed and ready to eat as a snack, or to add to a salad, or to use in a cooked dish. Of course, you can also pick up fresh beets at your grocery store or farmer's market. They are a bit more work to prepare, but are also delicious. (Look for golden beets too.) Plus, if you get beets with the greens still attached, they are good to eat too (and very nutritious). When roasting prepared beet products, you don't need to cook them very long, so either add them later in cooking or roast with other fast cooking veggies. Will you give beets a try? Or do you already eat them? I still cannot wrap my brain around beats. My dad used to buy them canned, warm them up in the microwave and eat them out of a cereal bowl. I can still remember the smell to this day. I am hoping to find a way to bring this food back into my life. It might be a good challenge. 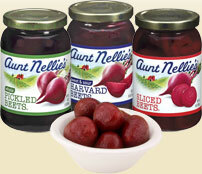 This has nothing to do with beets but I was wondering how you get to older posts on your blog. I see your links for individual recipes but how would I read your blog from newest to oldest or vice-versa? I'm not quite sure how I ended up deleting the "previous post" link at the bottom. I will be adding links in the future to all of the cookbook reviews, and possibly the food reviews that are still relevant. That won't get you to all of the old posts, but certainly the vast majority. I used to think beets only came from a can; then my mom and I decided to plant some, and I realized that when you roast them fresh, they actually taste good! I like to cut them into little half moons and roast them with some olive oil, salt and pepper -- so simple, but incredibly delicious! I've converted many a beet-hater with this recipe. I think if everyone could try them this way, they would love them too. Canned beets do such a disservice to such a fabulous vegetable! Make a yummy beetza! Stretch out some pizza dough, drizzle with a little olive oil and smear with lots of roasted garlic, throw on slices of roasted beets (mix golden and red and it is super pretty), top with a little cheese and bake. YUM!! My husband converted me into a beet-lover with this simple recipe: sauté grated raw beets in butter, with plenty of lemon juice squeezed over the beets as the cook. I have to agree about beets they are so delicious and versatile. My favorite sandwich is slices of avocado and fresh, boiled beets on heavy whole grain bread. Nothing else needed. My husband hated beets when we met, but he had never tasted fresh beets. He has been converted!